On our trip to Garzal, Pastor Salvador sent Phil and Gladys home with a half a feed sack of oranges that we helped pick from the tree in his yard. They are tough to peel and full of seeds, but really sweet and juicy. 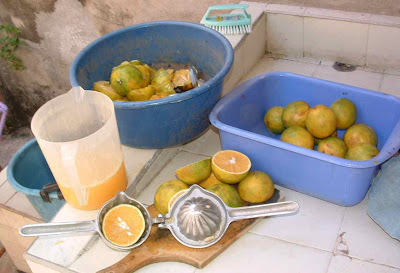 So, the above picture is how we process the juice here at the office out at the pila (washing place) on the back patio.